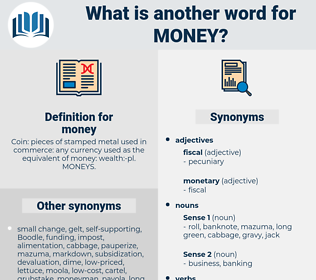 What is another word for money? kroner, Denarii, Sous, expenditure, wealth. dough, purse, spending, fortune, appropriation, means, revenue, laundering. What does it matter if she has money? I wish I could find a little money. maim, ma'am, many an, mynah, mayo, mammy, menomini, maia, moony, meow, mona, mimeo, may 1, moue, may, mean, mao, meanie, miaow, mayan, mann, mania, maine, mien, mine, mannheim, may 24, miaou, me, myna, mayhem, mooneye, mahan, maoi, mina, mho, moneyman, minion, muon, monomania, menominee, moon, ma, muumuu, moon on, maha, m1, man, may wine, mane, minim, meany, moan, Minyan, Moho, mya, M.M., maui, miami, minnow, minium, Moonie, mon, mahoe, miao, mummy, men, meme, momma, many a, mo, mn, mam, maya, m2, mayenne, minoan, mum, mammee, mahimahi, mym, mahonia, mama, mnium, mayhaw, m-1, mamey, mammea, manama, mown, mini, munni, mu, mamma, menu, mammon, min, mem, mime, memo, myoma, mi, minimum, 8 May 1945, mommy, menuhin, monoamine, moo, moynihan, mamo, mom, m3, mew, mahayana, moa, mei, mm, main, M, manna, mow, maw, minah, manannan, mono, many. bread, kale, subsidisation, Boodle, loot, wampum, monetary fund, big bucks, big money, moolah, sugar, megabucks, appropriation, pelf, simoleons, lolly, lucre, fund, pile, cabbage, token money, lettuce, shekels, scratch, sterling, gelt, bundle, subsidization, shinplaster, clams, dinero, dough. monetary system, medium of exchange, currency, wealth.